COPPERAS COVE, TX — Optimist International is celebrating their anniversary after a century of operations. 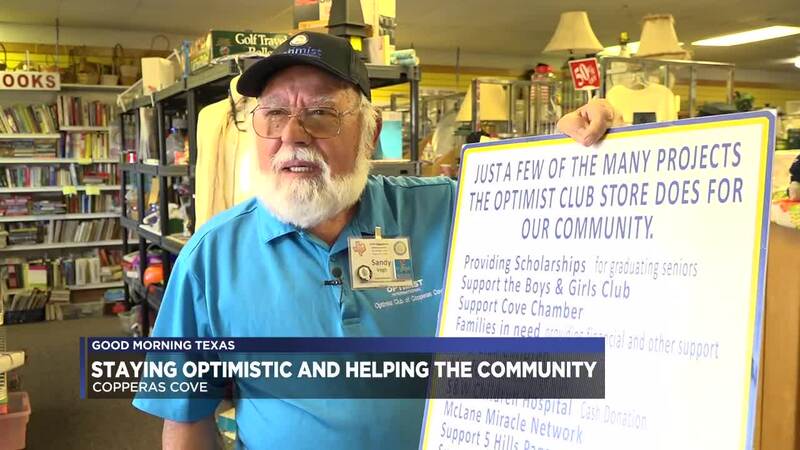 Copperas Cove has their own optimist club, although only serving the community for 15 years they are proud to be apart of such a great organization. Optimist clubs work hard to bring the best of out children and the community by providing uplifting spirits and a positive outlook on life. The Copperas Cove Optimist Club focuses on the kids in the community and donates hundreds of dollars each year to support childhood cancer prevention. "Just two weeks ago we gave a thousand dollars to the McLane Children Hospital and also a thousand dollars for medical network. We do this every year for the past 10 years," said Sandy Vegh, President of Copperas Cove Optimist Club. They even have their own thrift store where they sell donated items to help raise funds for the community. Anyone can donate to the thrift store the usually see an influx during the weekend where people will bring in their garage sale items they didn't sell. Also, each year this club helps the teachers of the Copperas Cove. They ask the community to nominate teachers and the club will randomly select 10. Those 10 teachers received $100 to help with purchasing items for their classroom. Copperas Cove Optimist Club loves to focus on the children since they are they are our future. If there is a way to show them how good the community can be they will lead a happier life growing up. For more information on Optimists International and to start your own optimist club visit their website .